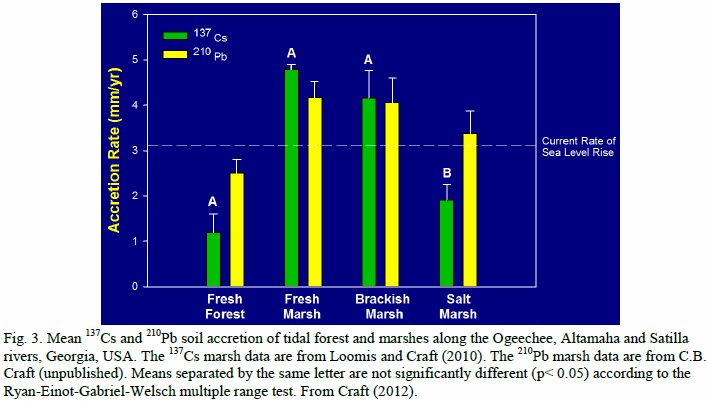 GCE-II involved studies of marshes along the longitudinal gradient of the Altamaha River estuary (Q3), high marsh along the lateral gradient to upland habitat (Q4), and how these gradients affected organism distributions (Q5). These questions are integrated in Area 3, which focuses on how the dominant marsh habitats in the domain will respond to the changes in salinity and inundation that might be expected in the coming decades: sea level rise in Spartina marsh/tidal creek habitat, upstream salinity intrusion in fresh/brackish marsh, and changes in hydrologic inputs from adjacent uplands to the high marsh. The proposed research will provide data on the responses of each habitat to changes in these drivers over different time scales, allowing us to characterize their resilience and to compare their trajectories in forward and backward directions (evidence for hysteresis). As described above, the effects of these perturbations will depend on the timeframe over which the system is altered, with short-term pulses potentially affecting organismal behavior and physiology and long-term presses potentially resulting in a habitat (state) change. To the extent that we can characterize transitions and identify state changes (through either long-term temporal patterns or spatial patterns observed along known gradients), this work also positions us to evaluate whether habitat shifts in the marsh are associated with increases in autocorrelation and variance, and slowed recovery from perturbations. Our goal is to characterize the responses of the marsh habitats in the domain (Spartina marsh, fresh/brackish marsh, high marsh) to pulses and presses in salinity and inundation. We work in each of our key marsh habitats to assess how they will respond to changes in salinity and inundation. A) In the Spartina marsh we will assess marsh-atmosphere and marsh-creek exchange; monitor and model Spartina primary production; assess organism interactions; and evaluate ecosystem metabolism. B) In the fresh/brackish marsh our work involves long-term observations along the transect of the Altamaha River, and a large-scale field manipulation to evaluate how pulses and presses of salt water affect a tidal freshwater marsh. C) In the high marsh our work involves a field survey of high marsh areas, an experimental manipulation of runoff to the high marsh, and modeling of plant communities. Spartina alterniflora is the dominant plant species in the salt marshes in the GCE domain, and in most salt marshes in the US, and serves as the foundation species in this habitat. S. alterniflora is generally found between mean sea level and mean high water, with the tallest plants occurring at low elevations along creekbanks and shorter plants occurring at higher elevations in the midmarsh. Spartina habitat (hereafter, Spartina marsh) is flooded and drained twice daily through a network of tidal creeks, which serve as the primary hydrological link between intertidal and open water areas. These small creeks, which can drain almost completely at low tide, are important for nutrient and material exchange and also serve as conduits for aquatic organisms including nekton, epibenthic fauna (e.g. crabs), and planktonic larvae. We expect sea level rise to be the chronic "press" driver affecting Spartina marshes. Thus, understanding how Spartina marshes respond to variation in inundation is critical for predicting the future state of coastal marshes in general. Increased inundation due to interannual variability in sea level (a pulse increase) has been found to increase NPP, but the relationship reverses at the highest sea levels, when increased flooding of tall Spartina, growing at the lower limit of their flooding tolerance, decreases productivity. At very high inundation levels plants die and no longer bind sediments with their roots, creating an unstable transition between Spartina marsh and mud flat. Understanding plant production is only part of the story, however, as the fate of this production (respired to the atmosphere, stored in the marsh, or exported to open water) will also vary with inundation patterns. Inundation also affects the amount of time that aquatic organisms can access the marsh, which may feed back in complex ways to affect plant productivity. Finally, changes in inundation may alter creek drainage patterns in the marsh. Riverine estuaries such as the Altamaha have a longitudinal gradient of habitats (fresh marsh, brackish marsh, salt marsh) that vary in their delivery of ecosystem services. Our previous studies have shown that the distribution of plants along this gradient is largely defined by salinity, interacting with competition, and that changes in vegetation are accompanied by shifts in community structure, biogeochemical cycling, and other processes. We expect salinity variation, in response to changes in river inflow or salt water intrusion, to be the major driver affecting fresh and brackish marshes. Understanding how these habitats respond to salinity variation is therefore important for predicting potential state changes along the estuary. We hypothesize that biotic and ecosystem responses to changes in salinity will be nonlinear (e.g. the system will display hysteresis), and that freshwater marshes will be less resistant than brackish habitat to increasing salinity. We will investigate these ideas using a combination of long term observations and field manipulations. The high marsh is the intertidal area closest to the upland, and is typically dominated by the plants Borrichia frutescens and Juncus roemerianus. High marsh plant and animal communities are more diverse than those at lower elevations (i.e. Spartina marsh), and the high marsh is more likely than other marsh habitats to exchange materials and organisms with upland areas. Our survey of marsh hammocks in GCE-2 found that the nature of the upland predicted multiple aspects of the high marsh habitat. High marsh habitat is potentially vulnerable to the long-term press of sea level rise, which could cause a lateral shift in its borders, to pulses in precipitation, which cause variation in salinity, and to the long-term press caused by anthropogenic alteration of the uplands, which may alter hydrologic connectivity. The vegetation in the high marsh is influenced by inundation and salinity; greenhouse experiments in which we varied both factors suggested that increasing inundation restricts Borrichia to the high marsh, whereas Juncus was more affected by increased salinity. The Juncus results support our observations that drought induces a shift in the Spartina/Juncus border towards dominance by Spartina, and with experiments that show that reducing salinity increases Juncus abundance. Once removed by a disturbance, the Juncus is slow to recover, leading to hysteresis. The high marsh is also affected by shoreline modification and upland development. A number of studies have correlated human activities in the upland to high marsh abiotic and biotic variables. We hypothesize that the spatial extent of the high marsh is primarily determined by geomorphology and hydrologic connectivity with the upland (both of which can be altered by humans), and that temporal variation in community composition is primarily due to variation in salinity. We will investigate these ideas using a combination of long term observations, field surveys, experimental manipulations and modeling. Description: We have only a very preliminary understanding of the atmospheric flux of CO2, H2O, and energy to/from Spartina marshes (with their embedded drainage creeks), and how this exchange is affected by presses and pulses in inundation (Kathilankal et al. 2008). We will use data from the eddy covariance flux tower (Area 1) to address this issue (Hollinger et al. 1994; Black et al. 1996; Goulden et al. 1996). We will do footprint climatology analysis (Amiro 1998) to track the footprint over time using Lagrangian dispersion models (Leclerc et al. 1988), large eddy simulations (Leclerc et al. 1997), or higher-order closure Lagrangian Particle Dispersion Models (Sogachev & Leclerc 2011) so that we can confine our analyses to times when only the Spartina marsh is being sampled. This will allow us to quantify fluxes on an aerial basis and to relate CO2 fluxes to primary production measurements (see below). We will evaluate gas and energy fluxes with reference to diel and tidal cycles (measured with the water level gage installed at the flux tower), as recent observations suggest a pronounced reduction in CO2 marsh-atmosphere exchange rate as flood height and duration increases (Kathilankal et al. 2008; Polsenaere et al. 2011; Moffett et al. 2010). Description: We will measure above- and below-ground biomass monthly in short, medium and tall Spartina plots near the flux tower. These observations can be scaled up to provide an estimate of NPP for the tower footprint, and will be used as ground truth data for remote sensing of EVI and NDVI. We will also install a StarDot NetCam on the flux tower and collect RGB and IR images at 30 minute intervals for evaluation of plant phenology using PHENOCAM protocols (http://phenocam.sr.unh.edu/webcam/). Description: We will quantify the transport of dissolved C through the creek at the flux tower so that we can compare the relative importance of atmospheric versus lateral exchange from a Spartina marsh and evaluate how they vary over seasons and in relation to tide stage. We will estimate marsh-creek exchange by 1) determining the inundation pattern of the study creek using detailed elevation information and empirical observations, 2) developing hypsometric curves for the horizontal area of inundation versus tidal height using data from an ADCP deployed at the mouth of the creek over a period sufficient to cover a range of velocities and water level, 3) estimating C production in the creek drainage area using monthly observations of above and below-ground Spartina biomass in the flux tower area, scaled per m2, 4) quantifying DIC exchange at the mouth of the creek using measurements of DIC and alkalinity collected over several tidal cycles on a quarterly basis, for 2 y. These observations will be used with discharge velocity to estimate DIC flux over the marsh inundation area, and e) developing a C budget for the creek drainage area using estimates of C production in the creekshed and DIC exchange with the atmosphere and the creek. We will also measure C storage in soil cores using 210Pb and 137Cs. The remaining major C flux, organic C exchange, is challenging to quantify, as previous studies have shown that OC exchange is primarily particulate and episodic (Chalmers et al. 1985). Subsurface exchange via groundwater is also unknown. OC exchange will be estimated from DOC and POC samples collected during ebb and flood tides, and groundwater input will be constrained based on our hydrodynamic model. Net OC exchange will also be estimated by difference from the whole C budget. The results of these efforts will enable us to quantify lateral C exchange through a small tidal creek. 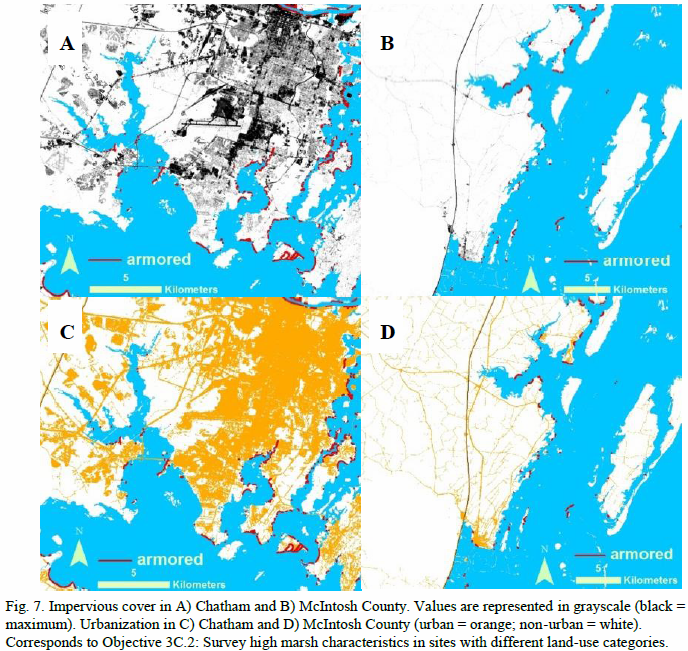 Description: We will evaluate net ecosystem metabolism and net C exhange in the open water of the Duplin River estuary by a) estimating C input by scaling from the flux tower/tidal creek observations, in combination with remote sensing of vegetation to estimate marsh NPP and marsh-atmosphere exchange, and with the Duplin hydrodynamic model to estimate C transport from the small tidal creeks and from groundwater, b) measuring ecosystem metabolism (GPP and R) using dusk/dawn transects of DO (quarterly for 2 y) to get a synoptic picture of respiration (corrected for atmospheric O2 exchange). Salinity will be used as a conservative tracer to mark specific water masses (Vallino et al. 2005). In addition, we have funding from YSI, Inc to develop a method to use DO and salinity records from sondes to measure metabolism in waters where advection can mask biological signals (see Hopkinson & Smith 2004), which would allow us to estimate metabolism on a daily basis. There are currently sondes operated by SINERR in the water of the upper and lower tidal prisms of the Duplin River, and we will add one in the middle prism volume, just downstream of the flux tower site. c) quantifying C flux by coupling direct measurements of pCO2 and DIC with estimates of ecosystem metabolism we will also collect discrete samples along the axis of the estuary to measure DIC, alkalinity and pH (to calculate pCO2) and total organic C on a monthly basis, and d) evaluating net C exchange between the Duplin and Doboy Sound using C concentration at Marsh Landing (the mouth of the system) in combination with water flow (measured with an H-ADCP). We hypothesize that a) lateral C inputs are greatest in the upper Duplin, where the density of tidal creeks is greatest; b) the highest proportion of in-system processing occurs during the summer, when temperatures are highest; and c) increases in inundation will lead to a greater export of DIC to Doboy Sound. Description: We will perform a manipulative experiment in which we exclude blue crabs from entire creek-sheds for 3 y by blocking creek mouths with large-mesh netting (2.5 cm2) and removing crabs by trapping (n=5 exclusion and 5 control creeks). Overall nekton abundance will be assessed by periodic trapping. We will monitor plants and macroinvertebrates in permanent plots in the creekbank and mid-marsh zones of each creek-shed (n=10 plots/zone) before and during the manipulation. We hypothesize that, in the absence of blue crabs, snail densities will increase (especially at creekbank plots where blue crabs have easy access and snail densities are typically low), snail damage to plants will increase, and plant biomass will decrease. We further hypothesize that the absence of crabs will increase the densities of other important marsh macroinvertebrates, including bivalves and burrowing crabs, thereby driving a web of top-down effects that also influence decomposition, soil nutrient pools, and sediment flux. By understanding how inundation and salinity mediate the abundance of this important predator and evaluating the consequent effects on plant production and soil processes, we will be able to include top-down regulation as we assess habitat provisioning and C flow in our scenarios (Area 4). Description: We will measure above- and below-ground biomass monthly in short, medium and tall Spartina plots near the flux tower. These observations can be scaled up to provide an estimate of NPP for the tower footprint, and will be used as ground truth data for remote sensing of EVI and NDVI. These data and our long-term data sets (e.g. irradiance, biomass, meteorology, salinity) from GCE-I and -II will be used to produce a semi-empirical model for Spartina areal NPP and biomass that considers both above- and below-ground production. Below-ground Spartina production is affected by marsh elevation and inundation (Kirwan & Guntenspergen 2012).Existing models of Spartina photosynthesis do not consider below-ground allocation of resources (Fagherazzi et al. in press), and are unable to accurately predict long-term changes in above-ground biomass in the domain (Jung & Burd in prep). Understanding resource allocation was important for developing models in seagrasses (e.g. Burd & Dunton 2001), and we will use a similar approach here. The model will be used to evaluate how changes in salinity and inundation affect Spartina production. It will also provide the basis for a more mechanistic model that incorporates details of plant physiology (e.g. C4 photosynthesis, respiration, resource allocation and translocation). Description: Above- and below-ground plant biomass data near the GCE flux tower and our long-term data sets (e.g. irradiance, biomass, meteorology, salinity) from GCE-I and -II will be used to produce a semi-empirical model for Spartina areal NPP and biomass that considers both above- and below-ground production. Below-ground Spartina production is affected by marsh elevation and inundation (Kirwan & Guntenspergen 2012).Existing models of Spartina photosynthesis do not consider below-ground allocation of resources (Fagherazzi et al. in press), and are unable to accurately predict long-term changes in above-ground biomass in the domain (Jung & Burd in prep). Understanding resource allocation was important for developing models in seagrasses (e.g. Burd & Dunton 2001), and we will use a similar approach here. The model will be used to evaluate how changes in salinity and inundation affect Spartina production. It will also provide the basis for a more mechanistic model that incorporates details of plant physiology (e.g. C4 photosynthesis, respiration, resource allocation and translocation). Description: Our existing monitoring transect along the Altamaha River (GCE 7, 8 & 9) grades from fresh to brackish to salt marsh. We will continue to monitor these sites, and will add an additional core monitoring site upstream in the tidal freshwater forest (GCE 11) as well as quarterly transects to track the upstream extent of saltwater (Area 2), as we expect this upstream area to be vulnerable to salinity intrusion over the long term. We will also establish permanent vegetation monitoring plots at the transitions between fresh and brackish (Zizaniopsis/ Spartina cynosuroides) and between brackish and salt marsh (S. cynosuroides/S. alterniflora) vegetation. These will be analyzed for changes in relative abundance and plant production over time to allow us to track forward and backward trajectories in response to changes in external drivers. We will also obtain aerial photographs that cover the salinity gradient of the Altamaha River estuary annually to document larger scale changes in plant communities. These will be analyzed with geostatistical techniques to characterize the transitions between habitats and track disturbance and recovery over time (Kent et al. 2006). Description: To predict habitat shifts over long time-scales, we will use a modification of the EPA SLAMM model (Brittain & Craft 2012). In its most basic form SLAMM uses elevation, habitat distribution and other variables to predict how tidal freshwater forest, fresh, brackish and salt marshes, and other land cover types (e.g. open water) will respond to different sea level rise scenarios. We have used SLAMM previously to evaluate the ecosystem services provided by different marsh habitats (Craft et al. 2009), and are currently running an updated version of the model for the South Atlantic Bight (with separate funding). The new forecasts will use new coastwide LIDAR and an update of habitat types from the National Wetland Inventory. We will also evaluate the effects of different Altamaha River inflows on salinity patterns, using our SqueezeBox analyses (Sheldon & Alber 2002, 2005). We recognize that SLAMM has limitations and are working to incorporate biophysical feedbacks (Morris et al. 2002) into the model, using detailed measurements of elevation and plant distribution collected across the domain. Description: We have two hammocks with instruments that continuously measure groundwater conductivity (salinity), temperature and pressure (water level) in well transects that run from the upland through the adjacent high marsh habitat. We will continue these observations to better understand how precipitation and tidal inundation affect the groundwater regime. Ongoing analyses focus on the role of tidal inundation, tidal pumping (Schultz & Ruppel 2002), hammock and barrier island freshwater heads, and their integration into a marsh subsurface flow model. We are also measuring precipitation, soil moisture, and porewater salinity, which can be used in the soil model (Area 4). Description: We will survey high marsh characteristics at 15 sites in each of 3 land-use categories: 1) marshes where the upland is developed and the upland/marsh interface has been modified by bulkheads, 2) marshes where the upland is developed but the upland/marsh interface is not armored, and 3) marshes where the upland/marsh interface is adjacent to undeveloped forested borders. We will use our GIS data on the locations of armored shoreline and land use to select appropriate sampling sites (Fig. 9). Each site will be at least 20 m in length along the upland/marsh edge, separated by at least 30 m from the next site, with treatments interspersed. At each site, we will locate 3 transects perpendicular to the marsh edge, with plots located at 2, 4, and 8 m along each transect. We will use GIS and ground observations to characterize the adjacent upland at each site (land cover, percent impervious surface, upland buffer width). In the marsh, our approach will be similar to the survey of undeveloped hammocks in GCE-II so that data can be directly compared. We will characterize the high marsh geomorphology (slope, origin, elevation) and sedimentology (stratigraphy, grain size) at each site, and the soil characteristics (grain size, organic matter content, sediment C and N), pore water (salinity, nutrients), flora (vegetation composition, height, N content) and fauna (snail, bivalve and crab abundance and sizes, stable isotope values, macroinvertebrate parasite loads) in each plot. We will also delineate the upland border and the edge of the high marsh (defined by a transition to Spartina alterniflora) with DGPS, and survey the elevations of each plot and the edge of the high marsh with RTK GPS. Description: We propose to experimentally test the hypothesis that water flow from the upland to high marsh directly affects high marsh function. We will work in high marsh areas adjacent to Sapelo Island where the vegetation is a mixture of Juncus and Borrichia. Our experiment will have 3 treatments: 1) upland water reduction (to assess how upland connections, as opposed to elevation, mediate high marsh community composition); 2) impervious surface addition (to assess how increased runoff and decreased groundwater alter high marsh community composition); and 3) controls. Plots (n=8/treatment) will each extend 10 m along the upland/high marsh border and be separated by at least 10 m, with treatments fully interspersed. The water reduction treatments will have vertical plastic barriers (sheeting that extends from 60 cm deep to 30 cm above the soil surface) that will divert shallow groundwater and runoff away from the plots. The impervious surface treatment will use corrugated plastic roofing just above the soil surface to cover the upland immediately adjacent to the marsh plot (with gaskets around tree trunks to intercept stemflow). A ditch will be dug and then filled back in in the control and impervious surface treatments to control for the disturbance of installing the barrier in the water reduction treatment. The experiment will be set up in year 4 and will last a minimum of 3 y. We will use DGPS to delineate the edge of the high marsh, and establish permanent sub-plots in each plot located 2, 4 and 8 m from the upland edge, which we will survey with an RTK GPS along with the elevation of the high marsh edge. We will use standard GCE protocols to monitor pore water salinity, plant photosynthetic rates, plant biomass and composition, and benthic invertebrate density and composition in each sub-plot. Measurements will be weekly for the first 8 weeks to capture the short-term response, monthly for the next year, and quarterly thereafter. Description: We will use a spatially structured model of clonally growing plants (Mony et al. 2011) to evaluate interactions among the dominant high marsh plants at our study sites. The model will be parameterized with information from greenhouse experiments in GCE-II on the responses of each plant to variations in salinity and inundation, augmented by information from the Spartina physiology model. It will allow us to evaluate the dynamics of habitat shifts that might occur in response to changes in freshwater delivery or sea level rise, and to identify conditions promoting hysteresis in habitat transitions. The plant community model will also be integrated into our large-scale modeling efforts (Area 4). Activities: We have developed routines to check and process the data stream from the flux tower so that we can calculate fluxes. We are now testing algorithms for footprint modeling, which will be linked to vegetation characteristics. We are also interested in whether the presence of surface fog affects marsh-atmosphere interactions (see Results Fig. 1). Activities: We have begun analyzing the data collected by the flux tower to characterize the effect of tidal inundation on CO2 exchange. Results: Our analyses show that light response curves vary as a function of the ratio between plant height and inundation (Results Fig. 5), and suggest that flooding reduces CO2 flux by approximately 20%. A poster on this work was recognized as a runner-up in the student poster competition at the LTER All Scientist’s Meeting. Activities: We are using these data to generate a gap­filled annual estimate of net ecosystem exchange (NEE) in the marsh. Results: Our initial analysis of CO2 exchange at the flux tower suggests that NEE is reduced by 55% when the marsh is covered by water (Fig. 8). Activities: We are evaluating the effects of environmental factors on annual and seasonal rates of NEE, R, and GPP. Results: Characterize temporal variability in marshatmosphere exchange of CO2 I. Forbich (PIE) is using flux tower data from PIE, GCE, and several other Atlantic coast sites to compare CO2 fluxes across a latitudinal gradient. She has found differences in terms of seasonality and magnitude, which link to patterns in NDVI and potential environmental drivers. Activities: We installed a StarDot Netcam on the GCE eddy covariance flux tower in mid-September. Images are relayed hourly to servers at UGA and then uploaded to the ecosystem phenology web camera network (phenocam.sr.unh.edu/webcam/sites/gcesapelo/). We also began monitoring above- and below-ground biomass of Spartina alterniflora in three marsh zones so that estimates of gas flux from the tower can be linked to changes in plant biomass and allocation. Activities: The phenocam camera collects images every 30 min. Samples of S. alterniflora are collected on a monthly basis so that flux tower observations can be linked to vegetation. This year we timed plant sampling to correspond with Landsat overpasses so that our findings can ultimately be scaled up. Results: Analysis of PhenoCam images using the green chromatic index showed the seasonal cycle of plant production and revealed that dates of spring green-up and fall senescence differ by marsh zone (Fig. 4). Activities: The phenocam camera collects images every 30 min and contributes data to the national phenocam network. We continue to sample plants in permanent plots on a monthly basis for above and below-ground production, timed to correspond with Landsat overpasses so that our findings can ultimately be scaled up. Results: We have developed a smart classifier for automatically extracting information from the phenocam images. This is being written up for publication. Activities: The phenocam camera contributes data to the national phenocam network every 30 min. We continue to sample plants in permanent plots, timed to correspond with Landsat overpasses. Results: O'Connell and Alber (2016) developed a method to filter out phenocam scenes with poor solar illumination (clouds) or non¬target objects (floods), which provides us with a subset of optimal scenes for phenology analysis (Fig 9). Results: Evaluate Spartina plant phenology The first 3.5 years of phenocam imagery was used to develop a phenology model for Spartina alterniflora. We found evidence for both spatial and interannual differences in phenophase length (Fig. 5). Activities: We have instrumented the creek adjacent to the flux tower with a Nortek ADCP to quantify transport of water into the marsh surrounding the flux tower as a function of tidal elevation. . We have also made initial measurements of total CO2, pH and total alkalinity over a tidal cycle. Activities: This past year we conducted quarterly field campaigns to measure total DIC in the creek that floods the flux tower. We sample water over the course of a tidal cycle for analysis of CO2, pH and total alkalinity, measure water height, and deploy an ADCP to measure water flow. Results: DIC in the ebbing creek water was higher than in entering floodwater, due to respiration by marsh flora and fauna and diffusion of DIC-rich pore waters while the marsh was flooded. Presumably CO2 flux to the atmosphere was reduced by an amount equivalent to that gained by the water column. Activities: We analyzed field samples collected over the course of Year Two to evaluate DIC exchange between the small creek adjacent to the flux tower and the Duplin River. We also developed hypsometric curves (Activities Fig. 3) to characterize water flow. Results: The creek imports water that is low in DIC concentration during flood tide, and exports water high in DIC during ebb (Results Fig. 6). This suggests that the marsh platform and creek banks are the apparent source of this C.
Activities: We calculated metabolism over the inundated marsh based on Year 2 field observations taken in the tidal creek adjacent to the GCE flux tower. Results: We found that the flooding of the marsh exports DIC to the estuary most seasons of the year and is responsible for a major portion of overall system net heterotrophy and about 1/3 of air¬water exchange of CO2. Activities: As part of our quarterly field campaign we conducted rapid surveys along the length of the Duplin River at dawn and dusk to evaluate diurnal changes in total CO2 and DO to estimate GPP, total system respiration, and NEP. We also collect DIC, pH and TA samples on a bimonthly basis. Results: We see substantial diurnal changes in DO and DIC in the Duplin River, signifying a high level of system metabolism. We also see deviation from saturation, which provides evidence for large air-sea exchanges as well as the overall heterotrophic nature of the Duplin system. There are also large downstream gradients in DO, DIC, chlorophyll and DOC, which suggest the export of materials to Doboy Sound and presumably the coastal ocean. Activities: We used the in situ diurnal technique to estimate metabolism from our Year 2 field measurements. Water masses were matched using a Lagrangian particle tracer model, and the rates of change of DO and DIC were used to calculate GPP, R, and NEP after correcting for air-water exchange and dispersion mixing. We also continued to collect DIC, pH and TA samples on a bimonthly basis. Results: We found that the Duplin estuary is highly productive and heterotrophic, with overall levels increasing up-estuary where the ratio of marsh/water and tidal creek drainage density are highest. The dispersion and air-sea fluxes were a significant component of the overall diel changes in DO and DIC. Activities: We used the in situ diurnal technique to estimate metabolism from our Year 2 field measurements. Results: The metabolism of the Duplin marsh¬estuary system reflected seasonal patterns for GPP, R, and NEP (Fig 10). Annual NEP is net hetrotrophic, with maximal values during warmer months (Wang 2016). Results: Evaluate net ecosystem metabolism and quantify net C exchange in the Duplin R. Wang et al. (2017) published a complete budget of CO2 exchange in the Duplin River estuary. They found that the overall system was a net source of CO2 to the atmosphere and coastal ocean and a net sink for oceanic and atmospheric O2 (Fig. 6). Activities: This begins yr. 4. However, we did some initial tests and found that our proposed predator exclusion design was not effective. Our current plan is to use replicated 10 m diameter cages with different mesh sizes to tease out the effects of blue crabs, mud minnows, and larger nekton. Plans: We will have a planning meeting at the GCE annual meeting in January 2016 and then deploy cages in the spring. Activities: We initiated a predator exclusion experiment in summer 2016 by setting up 8 6­m diameter, 1.5 m high predator exclusion cages along with cage and uncaged controls in the medium Spartina zone along Dean Creek. We assessed initial conditions and will be monitoring primary production, decomposition, species diversity and abundance, biogeochemistry, and geomorphology. Activities: We have begun regular sampling of the predator exclusion experiment initiated in summer 2016 in the medium Spartina zone along Dean Creek. Results: Conduct a predator removal manipulation Our initial 6 months of data show significant increases in both periwinkle snails and fiddler crabs in treatments where nekton is excluded (Fig. 7). Activities: We began monitoring growth of 16 headward-eroding creeks in 2011. These creeks are distinguished by an unvegetated basin at their head that supports high populations of burrowing crabs. Activities: We continued monitoring the growth of 16 headward-eroding creeks, distinguished by an unvegetated basin at their head that supports high populations of burrowing crabs. Results: Annual monitoring of creeks in the GCE domain for 4 y has revealed that growth rates vary substantially among years (Fig. 5). We will continue to monitor creeks annually in order to determine the drivers of annual variation in growth rate. Activities: We continued this activity in 2014-5. Results: Vu (2016) found that ground measurements of headward erosion correlate well with those based on aerial photographs. 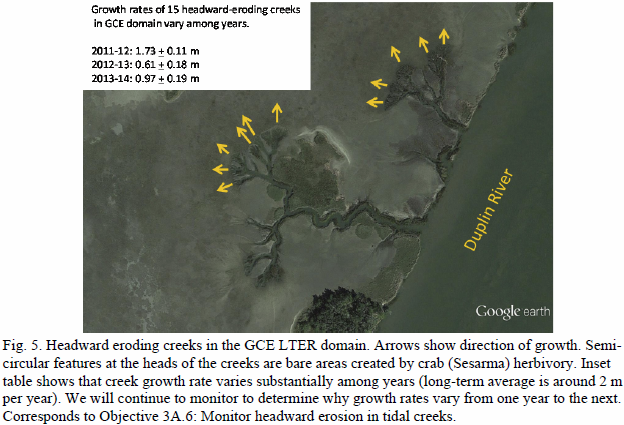 Results: Monitor headwater erosion in tidal creeks Vu (2016) found that ground measurements of headward erosion correlate well with those based on aerial photographs. Activities: Tests of our initial model of Spartina production suggested that a more detailed below ground component was required. We have now begun collecting samples to measure plant soluble carbohydrates in order to track plant allocation of resources. Activities: Tests of our Spartina model suggested that a more detailed below-ground component is required. We are therefore measuring soluble carbohydrates in above- and below-ground tissue in order to track allocation of resources. Plans: Data on soluble carbohydrates will be used to refine the existing model of Spartina growth. Activities: We have completed data analysis of a year's worth of above and below ground biomass and non-structural carbohydrate data, which is being used to develop model formulations for the translocation of material between above and below ground plant components. Results: Although there is a significant seasonality in above and below-ground nonstructural carbohydrates, there appears to be no obvious environmental cue for the allocation of this material. Activities: We are using the results of our field sampling of carbohydrates to develop models for the production of above and below ground biomass. Results: Jung & Burd (submitted) found that although Spartina non¬structural carbohydrates do not seem to correlate with any environmental variable, there is a consistent lag between above and below ground tissues indicative of transport. Activities: We have developed a model of Spartina production and biomass that includes a simple phenology with regard to translocation of resources between above and below ground biomass. We are in the process of parameterizing the model for the Flux Tower data. Results: Develop a Spartina physiological model Jung & Burd (2017) describes seasonal translocation of several different nonstructural carbohydrates between aboveand belowground tissues of Spartina alterniflora (Fig. 8). Activities: We have developed the conceptual framework for the porewater model, aimed to interface with the physical flow model. Activities: We have incorporated precipitation, evapotranspiration, salt exchange, drainage, groundwater, tidal inundation, and surface runoff into our porewater model. We also developed an algorithm to determine the water level at which the marsh floods. Results: Using the critical-flooding algorithm, analysis of marsh topography revealed that the marsh platform has many depressions (on the order of 10% of the domain area) that do not flood until the tidal elevation is well above the depression elevation. Activities: We have finalized the soil model, and begun to compare model results to measured porewater salinities. The independent estimates of freshwater inputs agree well, suggesting that the flow modeling and ET estimates are consistent. Results: One outcome of this effort is to constrain freshwater input to the upper Duplin. 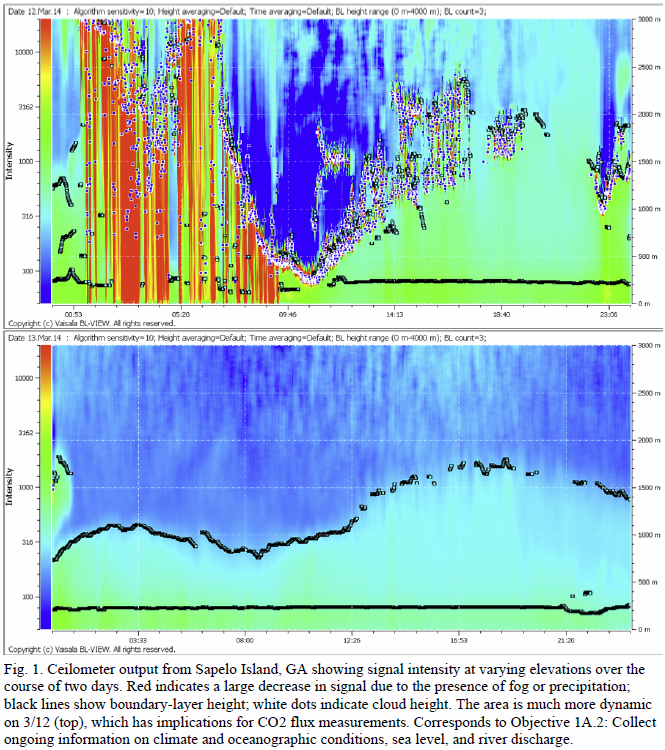 This work was presented at the 2014 AGU meeting and the 2015 LTER ASM. Activities: We have validated the soil model and continue to refine it. Activities: We have further refined the soil model, expanding the model for data comparison across different vegetation zones. Results: Develop a model to predict porewater salinity The model revealed that porewater salinity is sensitive to the composition of the creek water in the low marsh and to evapotranspiration in the high marsh. Activities: Epiphytic and benthic diatom samples were collected at 25 sites to characterization of diatom communities along the salinity gradient of the Altamaha. Activities: In 2012 we began an annual survey to document the transition in bankside vegetation from S. cynosuroides to S. alterniflora along the salinity gradient of the Altamaha. Results: Segarra et al. (2013 a,b) studied methane fluxes and methane oxidation in freshwater and brackish sediments along the Altamaha. Rate measurements of sulfate reduction and the anaerobic oxidation of methane (AOM), two processes not typically considered relevant in low salinity habitats, revealed their importance in freshwater settings. Activities: We continued our annual survey to document the transition in bankside vegetation from S. cynosuroides to S. alterniflora along the salinity gradient of the Altamaha. Activities: We continued our annual survey to document the transition in bankside vegetation from S. cynosuroides to S. alterniflora along the salinity gradient of the Altamaha. We have also developed a Random Forest classifier to extract vegetation patterns from Landsat5 imagery in areas with a fluctuating mix of oligohaline and mesohaline vegetation. Results: Assess changes in community composition along the salinity gradient of the Altamaha We have found evidence for a longterm shift (19912011) from oligohaline to mesohaline vegetation in the brackish area of the Altamaha river, with the majority of the change occurring in drought years. Activities: We have begun collecting baseline data (aboveground biomass, species composition, photosynthesis-respiration, greenhouse gas emissions, SET measurements). In a companion experiment conducted in the greenhouse, we exposed plants from tidal fresh and brackish marshes to 7 different salinity regimes over a period of 3 months. Results: Initial results from the greenhouse experiment indicated that sensitivity to saline conditions varied markedly among plant species. For example, Polygonum hydropiperoides aboveground biomass decreased sharply when exposed to saline conditions for 16 or 31 days per month, while Zizaniopsis miliacea biomass showed no response to salinity treatments (Fig. 6). Activities: In the GCE SALTex (Seawater Addition Long Term) experiment we began dosing experimental plots with saltwater (press and pulse plots) and are monitoring porewater, vegetation, herbivores, soil surface elevation, and gas exchange. In a companion experiment, we exposed mixtures of plants from tidal fresh and brackish marshes to water of differing salinity and for different lengths of time in the greenhouse. Results: Porewater salinity in the press plots has increased from 0 to about 4. Some plant species, especially forbs, are visibly stressed, and hydrogen sulfide emissions are evident. In the greenhouse, plant community composition was highly sensitive to salinity regime. We will monitor mixtures again in the spring to assess overwintering survival. Activities: We have been dosing the SALTEx plots for almost 2 years and are continuing monitoring of porewater, soil surface elevation, and gas exchange. We have begun monitoring surface algae and extracellular enzyme activity in the plots also. We are collecting soils for future analysis of microbial communities. This past year we also harvested the greenhouse mesocosm experiment in which we exposed mixtures of plants from tidal fresh and brackish marshes to water of differing salinity and for different lengths of time. Results: Seawater additions resulted in increased sulfate and chloride immediately, and porewater nitrogen and phosphorus increased 2-4 months after initial seawater application. Most of the freshwater plants have died in the press plots, which are continually exposed to brackish water (Results Fig. 7). Ecosystem respiration and methane emissions are also significantly lower and we are seeing a measurable decline in elevation and an increase in soil surface temperature. In the pulse treatments, the most sensitive plant species died back temporarily but recovered in the following year. In the mesocosms, plant community responses were a function of both salinity and the duration of exposure to saline water. Activities: We dosed the SALTEx plots for a 3rd year and continue to monitor porewater, soil surface elevation, gas exchange, vegetation and invertebrates. Soil samples from SALTEx plots were all extracted and analyzed for molecular biomarkers using GC­MS. We have also begun monitoring surface algae and extracellular enzyme activity. In May 2016 we initiated an experiment to compare the rates of decomposition of Zizaniopsis miliacea roots between treatments. Results: Craft et al. (2016) provided an overview of the SALTEX project and summarized initial results (Fig. 11). Plots subject to press additions of seawater have increased porewater Cl, SO4, H2S, N, and DRP, increased temperature, vegetation loss, and up to 2 cm of soil elevation loss. Preliminary results suggest a strong decrease of plant wax biomarker concentrations. Activities: We dosed the SALTEx plots for a 4th year and continue to monitor porewater, soil characteristics, plants and animals. This past summer we used the 15N in situ pushpull method to determine denitrification rates in the plots (samples are currently being processed). Recruitment of brackish marsh plants into SALTEx plots has been slow, so in May 2017 we transplanted 3 species to see how well they would perform if they did arrive. Results: Conduct field manipulation of salt water intrusion in a lowsalinity tidal marsh Li and Pennings described the vegetation response in field as part of the SALTEx experiment (Li and Pennings in review). In an accompanying mesocosm experiment, they found that both species richness and plant biomass decreased with increasing pulse duration and salinity (Fig. 9). Activities: We are collecting field measurements of elevation of different vegetation communities, including tidal forest, to improve SLAMM’s modeling capabilities, and are also working to link it to both the point-based MEM model of marsh accretion developed by Jim Morris (USC) and to Squeezebox, our estuarine salinity model. Activities: New inputs were acquired for SLAMM, including updated LiDAR, bathymetry and ground-truthed RTK data in the Altamaha River. Modeling runs are underway using various scenarios of sea level rise and river discharge. Activities: In the Altamaha River we have run the SLAMM model with the new inputs and are also working with Jim Morris (Univ. South Carolina) to run his point-based model (Marsh Equilibrium Model). In the larger domain, we have mapped the distribution of salt, brackish and tidal fresh marsh in the GCE domain using both the GCE new high-resolution imagery, LiDAR and regression tree models. These distributions will provide better initial conditions to better inform future SLAMM modeling. Results: Hauer et al. (2015) ran the SLAMM model as part of a coast-wide study of GA designed to improve population projections at sub-county scales. In McIntosh County, where the GCE is located, the projected population at risk to the threat of sea-level rise varied from 291 to 2,887, depending on the increase in sea level (1 or 2 m) and the year considered (2050 or 2100). Activities: E. Herbert worked with the SLAMM research group to include ecogeomorphic feedbacks between flooding depth, biomass, and accretion. Updated elevation and habitat datasets were also used (See Objective 4B3). Results: When the improved SLAMM model was run using a variable accretion rate, the predicted outcome for wetlands along the Altamaha River in the face of SLR changed from one of marsh loss to one of marsh gain. Activities: We are analyzing pressure time series from groundwater well transects connecting the marsh, a hammock and the main upland at Blackbeard Island to delineate the relative importance of tidal pumping, precipitation and density variations in driving groundwater flow across a marsh transect. Activities: We continued our analysis of the pressure data collected at groundwater wells installed along an upland-to-marsh transect. However, the sensors in these wells continue to fail under harsh coastal conditions. Results: We have separated out tidal influences on the pressure signals by fitting the signal using constituents with known tidal frequencies. We also corrected erroneous ground elevations. Although the identification of other driving forces is ongoing, we have determined that marsh topography has a critical impact on the pressure signal. Plans: We have halted data collection due to sensor failure. The manufacturer is working to design more robust sensors that can be field-tested at the GCE site. Activities: Sensors have been removed from hammock wells because of high failure rate. We have worked with Schlumberger (the sensor company) to redesign the sensors to be more resistant to the harsh conditions in the wells. Results: Ledoux (2015) used the sensor data to quantify the role of upland / precipitation driven groundwater flow. He found that it exceeds the impact of tidal forcing on net groundwater flow from the upland to the marsh. Plans: New sensors have been developed and will be deployed for testing at GCE sites. Activities: We have outlined time series analyses to interpret the groundwater observational data, building on Ledoux (2015). Activities: In summer 2013 we conducted field surveys of the high marsh at 60 sites. The survey included residential sites both with and without bulkhead structures as well as forested areas. Plant and animal distributions, sediment characteristics, porewater nutrient concentrations and microbial community composition are currently being analyzed to assess patterns and processes associated with upland class. GCE investigators also participated in a cross- site working group to evaluate the ecological impacts of coastal armoring on soft sediment coastal ecosystems. Results: We used geographic information systems to investigate the spatial distribution of armored structures in the state of Georgia with respect to land use and land cover. 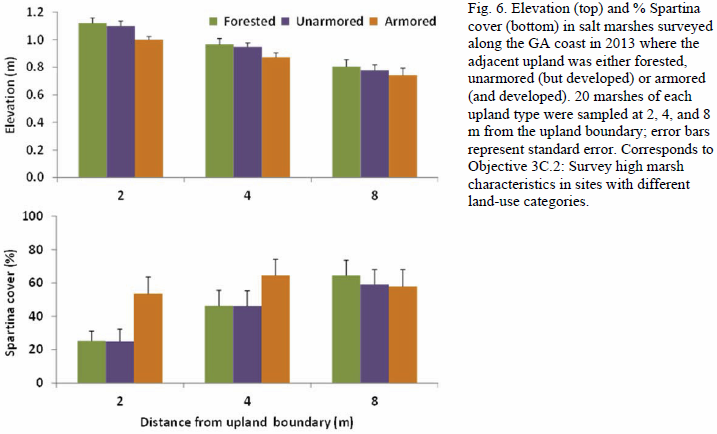 We found that upland immediately adjacent to hardened shorelines was highly developed at the parcel scale (Fig. 7), and the extent of armoring was tightly linked with indicators of urbanization at the county scale (impervious surface coverage; r = 0.98). GCE investigators participated in cross-site soft-sediment working group that conducted to a literature synthesis and the development of a matrix of ecological responses to shoreline armoring, both of which will be included in a manuscript that is currently being developed. Activities: We analyzed plant and animal distributions, sediment, porewater nutrients, parasite loads, and microbial community from samples collected during the yr 1 high marsh survey. We also continued working with a cross- LTER group to evaluate the ecological impacts of coastal armoring. Results: Elevations at bulkheaded, developed sites are lower than those at either unarmored developed sites or forested areas, and have a higher % cover of S. alterniflora (Fig. 6). The sediments at these areas are finer-grained, suggesting that transfer of sandy upland materials has been cut off by the installation of armoring. Activities: We conducted further analysis on the plant and animal distributions, sediment, porewater nutrients, parasite loads, and microbial community from samples collected during the yr 1 high marsh survey. We also continued working with a cross- LTER group to evaluate the ecological impacts of coastal armoring. Results: Freshwater input from the upland structures the high marsh community in our study sites. Spartina dominates near developed uplands with bulkheads; Juncus dominates near developed, but unarmored shorelines. We also found that movement across the ecotone by the land crab Armases cinerum varied with upland structure. This latter observation is especially interesting given that Hubner et al. (2015) found evidence for differences in both dietary and habitat preferences of Armases that can move freely between high marsh and coastal forests. Activities: We have completed all analyses on this project. Results: Gehman et al. (submitted) found that the effects of shoreline armoring were subtle in the high marsh. Armoring tends to make a site more like the low marsh (higher Spartina density and siltier sediment). Activities: We have identified a potential site for this experiment. We have surveyed and taken cores along three transect across the marsh-upland boundary to characterize the stratigraphy at the site and have requested permission from DNR to conduct the experiment. Results: The site proposed for the upland manipulation has a well-developed, clean, sandy, porous layer at ~1.0 m depth that serves as a conduit for freshwater from the uplands to influence the marsh. Activities: We received a permit from DNR for this experiment and collected pre­treatment data on plants, benthic algae, invertebrates, and groundwater. Treatments are set to begin later in 2016. Activities: We have two years of "before" data in the plots (2015 and 2016) and began treatments in 2017. We are tracking groundwater pressure continuously and sampled plants and invertebrates three times in the summer of 2017. Results: Conduct upland manipulation of water flow to high marsh areas Groundwater data are being used to characterize the horizontal hydraulic gradient at the upland manipulation site (Fig. 10). Activities: We measured the clonal architecture of 4 species of plants to parameterize the model. Results: We have established a web site (ScalingUpMarshScience.cs.uh.edu) that allows volunteers to help us align thousands of photographs into a mosaic of the marsh. A second web site under development will use volunteers to score plant and animal abundance in the images. This information will be used to compare with model predictions. Activities: The graduate student assigned to this project dropped out, and we have shifted our emphasis to documenting vegetation patterns on photographs collected as part of intensive annual surveys of a high marsh. These data will inform the upland manipulation and future work on a clonal plant model. Results: We are using citizen scientists to align and extract data from over 70,000 photographs that we have collected from a high marsh site over 7 years. Activities: We have shifted our emphasis to documenting vegetation patterns in photographs collected in annual surveys of a high marsh to inform the upland manipulation and future work on a clonal plant model. The web sites that allow citizen scientists to contribute data towards this project have been migrated to servers at UGA. Do hydrological conditions at creek heads stimulate Sesarma reticulatum recruitment? Effects of Sesarma reticulatum on tidal creek growth. principal investigator(s): Merryl Alber, Clark R. Alexander Jr. Craft, C.B., Herbert, E., Li, F., Smith, D., Schubauer-Berigan, J.P., Widney, S., Angelini, C., Pennings, S.C., Medeiros, P.M., Byers, J. and Alber, M. 2016. Climate change and the fate of coastal wetlands. Wetland Science and Practice. 33(3):70-73. Ledoux, J.G. 2015. Drivers of groundwater flow at a back barrier island - marsh transect in coastal Georgia. M.S. Thesis. The University of Georgia, Athens. 104 pages. Porubsky, W.P. and Meile, C. 2009. Controls on groundwater nutrient mitigation: Natural attenuation of nitrogen loading from septic effluents. In: Hatcher, K.J. (editor). Proceedings of the Georgia Water Resources Conference. Athens, Georgia. Widney, S., Smith, D., Schubauer-Berigan, J.P., Herbert, E., Desha, J. and Craft, C.B. 2017. Poster: Changes in sediment porewater chemistry in response to simulated seawater intrusion in tidal freshwater marshes, Altamaha River, GA. Society of Wetland Scientists Annual Meeting, June 5-8, San Juan, Puerto Rico. Smith, D., Herbert, E., Li, F., Widney, S., Desha, J., Schubauer-Berigan, J.P., Pennings, S.C., Angelini, C., Medeiros, P.M., Byers, J., Alber, M. and Craft, C.B. 2016. Poster: Seawater Addition Long Term Experiment (SALTEx). Georgia Department of Natural Resources Coastal Resources Division 2016 Climate Conference, November 2-3, 2016, Jekyll Island, GA.
Ledoux, J.G., Alexander, C.R. Jr. and Meile, C. 2015. Poster: Groundwater flow at the Georgia coast: Magnitude and drivers across a back barrier island – marsh transect. LTER All Scientists Meeting, Aug 30-Sept 2, Estes Park, CO.
Miklesh, D.M., McKnight, C.J., Di Iorio, D. and Meile, C. 2015. Poster: Controls on porewater salinity distributions in a southeastern salt marsh. LTER All Scientists Meeting, Aug 30-Sept 2, Estes Park, CO.
Ledoux, J.G., Alexander, C.R. Jr. and Meile, C. 2014. Poster: Delineating groundwater flow along a marsh transect at a back barrier island on the coast of Georgia. Southeastern Estuarine Research Society Fall meeting, November 6-8, Carolina Beach, NC. Alexander, C.R. Jr., Alber, M., Hladik, C.M. and Pennings, S.C. 2010. Presentation: Physical-Biological Interactions in Coastal Settings: The Georgia Coastal Ecosystem LTER Example. American Geophysical Union - Meeting of the Americas, 9-13 August 2010, Foz do Iguacu, Brazil. Alexander, C.R. Jr. 2008. Presentation: Stratigraphic Development of Holocene and Pleistocene Marsh Islands. Tidalites 2008 - Seventh International Conference on Tidal Environments, 25th-27th September, 2008, Qingdao, China.